Do you have an on-site contact ready to take delivery of the signage and supervise the installation and approve the finished signage? Are there any special access requirements (for example security passes or security gates) that Sign and Art should be made aware of. Have all relevant personnel (including security staff) been informed of Sign and Art presence on site? Are you aware of any potential safety hazards on site that could compromise the safety of the installation? Are you aware of any Building Regulations or Planning Restrictions that prevent the installation of the proposed signage in the intended location? Our dedicated installation team will deliver your new signage to your premises and will liaise with your arranged contact to discuss any access requirements to ensure installations are carried out safely and at your convenience. We will also remove any old signage and attempt to recycle and dispose of it in an environmentally friendly way. Our in-house installation team are equipped with the experience and the tools to ensure the perfect finish. 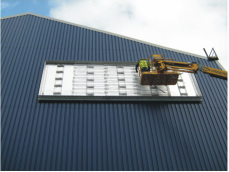 We are able to provide an installation service outside of London if required. Sign and Art appreciate that signage should be installed with minimum disruption to your day to day business. In extraordinary circumstances we can organise an out-of-hours service. Smaller signs and A Boards can of course be delivered to your premises with minimal disruption.